HMD Global has been on a roll this year with smartphone launches. Currently in India, the company is gearing up to launch the Nokia 5.1 Plus on September 24. 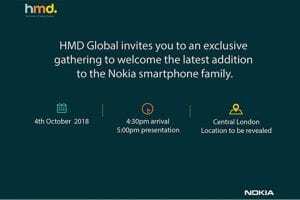 However, on the side, as the invite reveals, the HMD Global will be introducing a new smartphone on Oct. 4. The launch event will begin at 5:00 PM and it will be held at Central London. Nokia fans are eagerly waiting for the company to announce the Nokia 9 flagship phone that is speculated to arrive with penta-lens system.  However, a recent report has revealed that its arrival has been delayed as the Finnish firm is reportedly planning to announce it at the Mobile World Congress (MWC) 2019 tech expo that will be held in February next year. Recent reports suggest that the company may unleash the Nokia X7 instead of the Nokia 9 phone.Just as the Nokia X6 and Nokia X5 have arrived with notched display design, it is speculated that the Nokia X7 will be also coming with the same design. Yesterday, a leaked image showing the front and rear design of the phone had surfaced online. 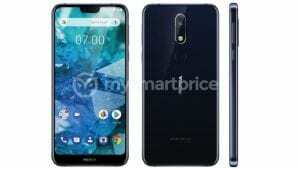 The Nokia 7.1 Plus has been leaked multiple times over the past few weeks. While some renders suggest a design language similar to the Nokia 6.1 Plus, other live images seem to suggest even bezels like the Nokia 7 Plus before. While we wait for HMD to start teasing the upcoming Nokia phone, here’s a quick recap of everything we know about the Nokia 7.1 Plus. Talking about the design, it is largely suggested that the Nokia 7.1 Plus will look similar to the Nokia 6.1 Plus and Nokia 5.1 Plus in order to keep some consistency in the X-series. Renders posted by Smartprice show us an edge-to-edge display with a notch and chin. The notch will likely be as small as the one on the 6.1 Plus. Meanwhile, the phone will be covered with glass on the front and back, perhaps Gorilla Glass 4 or higher. Renders also reveal a vertical dual camera setup on the back with a fingerprint sensor just below. If true, the would be a stark contrast to the Nokia 7 Plus (Review) which offers a 19:9 display on the front and a metal unibody back with a smooth ceramic coating. — notched display means the Nokia 7.1 Plus will come with smaller bezels all around and could sport a bigger display compared to the Nokia 6.1 Plus. We expect a 6.9-inch display, which would be similar to the Nokia 7 Plus, but in a more compact form factor. The resolution is said to be 1080×2280 and the aspect ratio will be 18:9. — The dual camera setup on the back will likely have Zeiss branding on it as per the renders posted by Smartprice. The Nokia 6.1 Plus and 5.1 Plus do not come with Zeiss lenses, but given that the Nokia 7 Plus did have the branding, it’s safe to assume the same will be true for the 7.1 Plus as well. As of now, the configuration of the sensors on board is still unknown, but we expect a bump from the Nokia 7 Plus. 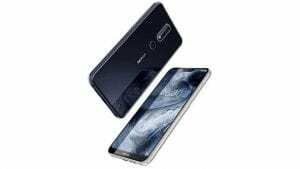 To recall, the Nokia 7 Plus comes with a 12-megapixel primary sensor with f/1.75 lens and Dual Pixel autofocus, and a 13-megapixel telephoto lens with 2x optical zoom. On the front, the device sports a 16-megapixel selfie snapper. — The Nokia 7 Plus comes with a Snapdragon 660 chipset, which is a pretty powerful mid-range processor. Rumours suggest the Nokia 7.1 Plus will take thing a notch higher with the Snapdragon 710 processor, which would make it HMD’s most powerful mid-range phone yet. The device could also come with up to 6GB of RAM and up to 128GB of internal storage. — We also expect a bigger battery capacity inside the Nokia 7.1 Plus, although nothing has been revealed as yet. The Nokia 7 Plus comes with a pretty solid 3,800mAH battery, which promises up to 2 days of battery life. It’s also a possibility the HMD will downgrade the battery to say 3,500mAh in order to keep the weight of the device lighter. Rumours also say the upcoming phone will support 18W fast charging. 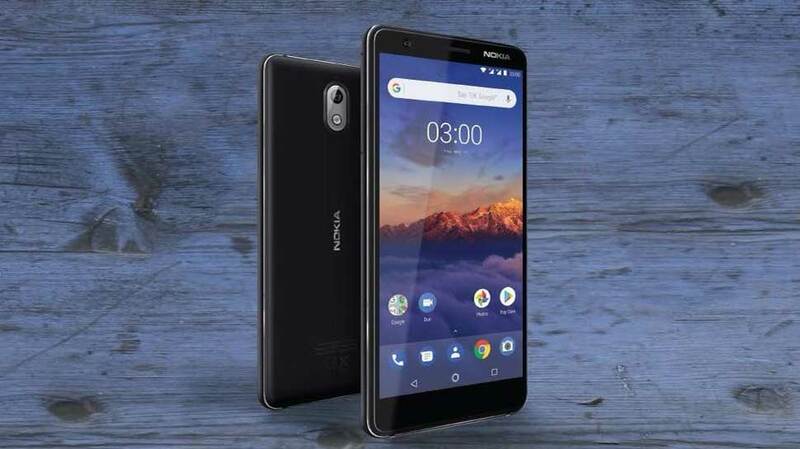 — Much like every other Nokia phone from Nokia 3.1 and upwards this year, the Nokia 7.1 Plus will also be an Android One phone. This means pure, stock Android experience out-of-the-box with monthly security updates for three years. Given the timing of the launch, we hope the Nokia 7.1 Plus will ship with Android 9 Pie. — The Nokia 7.1 Plus will most likely come to India by the end of the year. While HMD is yet to confirm anything, the company has brought every smartphone in its portfolio to the country so it’s unlikely it’s going to leave out the Nokia 7.1 Plus. As for the pricing, we expect the phone to cost around Rs 25,000 in India, similar to the Nokia 7 Plus. Next articleTop 12 World’s Most Richest Sports Team owners in 2018: Checkout! We rock!! “Dance like a monkey… Oh Yeah!